Our neighbors have just built a house extension that goes to the boundary line. As we live on a hill (they are higher than us), when they come into the garden from the extension they are waist high to our 6-foot boundary fence. They step onto decking then down steps into the garden. Could you advise what plants to use along the boundary edge to give us back our privacy. The problem being that the borders are only about 2 feet wide so we want plants that grow upwards rather than outwards. Thank you so much. If you are able to attach trellis above the fencing, hydrangea vine or hardy kiwi makes a good, thin, fast growing privacy plant. But they do need something to climb. If there is a specific part of the yard you want to keep private - like a dining area or a hot tub, you may want to consider building a pergola over it. You can plant a wide variety of plants to grow over it that look stunning and would create more privacy. 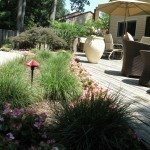 As your neighbor is higher than you, and I would imagine does not want to look into your yard any more than you want them to be looking - perhaps you could look at splitting the cost of planting something on their side of the fence. Maybe even standard privacy plants in containers on their deck.